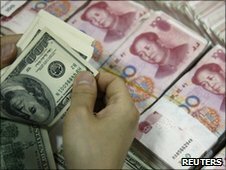 US President Barack Obama has welcomed China’s announcement that it will allow the exchange rate of its currency, the yuan, to become more flexible. Mr Obama called it a “constructive step”, saying it would help boost the global recovery. US politicians have long argued that the yuan is undervalued, giving China an unfair trade advantage. The issue is expected to be raised at a summit of the G20 group of industrial and developing countries next week. On Saturday, the Chinese central bank announced it would make its exchange rate mechanism “more flexible”. The bank said the proposed reform had been made possible by the global recovery. However, it gave no details about timing and ruled out any single large-scale revaluation of the yuan, saying there was “no basis for big fluctuations or changes”. The Chinese currency has been held at about 6.83 to the dollar since July 2008, drawing criticism that China was maintaining the currency at an artificially low level to help its exporters. Commenting on China’s announcement, President Obama said it was “a constructive step that can help safeguard the recovery and contribute to a more balanced global economy”. US Treasury Secretary Timothy Geithner cautiously welcomed the move. “This is an important step but the test is how far and how fast they let the currency appreciate,” he said. In April, Mr Geithner delayed a report that could label China a currency manipulator, in what was seen as an attempt to give Beijing time to reform its currency without appearing to do so under pressure. A number of members of the US Congress believe the low yuan is directly affecting their local economies. Responding to the announcement, Democratic Senator Charles Schumer said China’s statement was too vague. “Until there is more specific information about how quickly it will let its currency appreciate and by how much, we can have no good feeling that the Chinese will start playing by the rules,” he said. The BBC’s Damian Grammaticas in Beijing says the announcement may be seen as an attempt to preempt criticism of China’s currency policies at the G20 summit in Canada, where Mr Obama will meet China’s President Hu Jintao. China has kept the currency from rising by selling yuan for dollars and has built up massive foreign exchange reserves as a result. The way China invested those reserves is seen by many economists as a key factor in the recent international financial crisis. The head of the International Monetary Fund (IMF) Dominique Strauss-Kahn said China’s announcement was “a very welcome development”. US President Barack Obama and Russian President Dmitry Medvedev sealed a landmark arms-control treaty on Friday to slash their countries’ nuclear arsenals by a third and will sign it on April 8 in Prague. After months of deadlock and delay, a breakthrough deal on a replacement for the Cold War-era START pact marked Obama’s most significant foreign policy achievement since taking office and also bolsters his effort to “reset” ties with Moscow. Obama and Medvedev put the finishing touches on the historic accord during a phone call, committing the world’s biggest nuclear powers to deep weapons cuts. “I’m pleased to announce that after a year of intense negotiations, the United States and Russia have agreed to the most comprehensive arms-control agreement in nearly two decades,” Obama told reporters. But he could still face an uphill struggle for ratification this year by the US Senate, where support from opposition Republicans will be hard to come by after a bitter fight that ended in congressional approval of his healthcare overhaul. Russia made clear, however, that it reserved the right to suspend any strategic arms cuts if it felt threatened by future US deployment of a proposed Europe-based missile defense system that Moscow bitterly opposes. The agreement replaces a 1991 pact that expired in December. Each side would have seven years after the treaty takes effect to reduce stockpiles of their most dangerous weapons — those already deployed — to 1,550 from the 2,200 now allowed and also cut their numbers of launchers in half. Secretary of State Hillary Clinton said the new pact sends a message to Iran and North Korea, both locked in nuclear standoffs with the West, of a commitment to thwart nuclear proliferation. “With this agreement, the United States and Russia — the two largest nuclear powers in the world — also send a clear signal that we intend to lead,” Obama said. The treaty adds another chapter in a quarter century of efforts to make the world safer through nuclear arms control, after a 1986 summit between U.S. President Ronald Reagan and Soviet President Mikhail Gorbachev laid the groundwork. Obama and Medvedev will sign the new Strategic Arms Reduction Treaty (START) in Prague, capital of the Czech Republic, a former Soviet satellite now in NATO. The April 8 meeting will be close to the anniversary of Obama’s speech in Prague offering his vision for eventually ridding the world of nuclear weapons, and should help build momentum for a nuclear security summit he will host in Washington on April 12-13. The treaty does not impose limits on US development of a missile defense system in Europe, which had been a major sticking point in negotiations. Washington insists such an anti-missile shield would be aimed at Iran, not at Russia. “Missile defense is not constrained by this treaty,” US Defense Secretary Robert Gates said. But Russian Foreign Minister Sergei Lavrov said either side has the right to stop reducing offensive nuclear weapons if the other beefs up its missile defenses — a warning of consequences if Moscow sees a threat to its security. “It cuts, by about a third, the nuclear weapons that the United States and Russia will deploy,” Obama said. “It significantly reduces missiles and launchers. It puts in place a strong and effective verification regime. The new pact could strengthen Obama politically, building on the domestic political victory he scored this week when he signed sweeping healthcare reform into law. Obama still faces a fight to get a two-thirds majority for Senate ratification of the treaty at a time of bipartisan rancor after the bitter fight over healthcare and other parts of his domestic agenda. Republicans have criticized his national security policies and are in no mood to cooperate, especially ahead of November congressional elections where they hope to score big gains. Despite that, Clinton insisted the prospects were good for bipartisan support for the treaty. The final deal also signaled improved relations with Russia that had been badly frayed under Obama’s predecessor George W. Bush. Obama needs Moscow onboard for any further international sanctions against Iran over its nuclear program. It showed that Moscow and Washington can find a way to work together despite differences over a host of issues from Georgia to missile defense in Europe.